The next time you feel the urge to feed people, this is the dish to use. If your kitchen is under siege by your CSA's constant stream of root veggies, it's also a good solution. In fact, it currently occupies the slot of my favorite winter dish. I often serve it with/over creamy polenta, but it's just fine on its own served like a hearty stew. -Pre-heat oven to 400. Put all the veggies in a ziploc or tupperware and toss with olive oil and spices (through salt). Add to a roasting pan or casserole dish. Cover with chicken broth-you can always add a little more if you like lots of extra juice, but this should make plenty. -Then use the tupperware to toss the chicken with olive oil and spices. Place on top of the veggies. 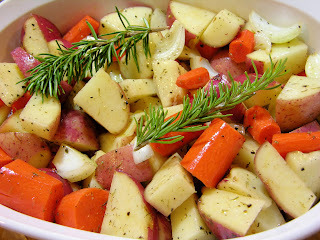 Put one piece of rosemary on each side of the dish on top of the veggies. Cover with foil or a lid. Bake for 30 minutes. Baste the chicken with the juices. Bake for 30 more minutes. -Technically it should be ready at this point, but I leave mine in another 15 minutes, basting it one more time, and lowering the temp to 350. If you're thinking about skipping the rosemary, it really makes a huge difference. Don't leave it out if you can scrounge some up.